Think your graduation was cool? Maybe it was. Maybe it was totally gnarly. But, I'll tell you what, I'm pretty damn sure Sailor Moon didn't roll in and a red Pikmin didn't stroll up on stage. Oh, and there probably wasn't a large Wii Remote, nor was there a large Xperia phone. Call it a hunch. If that did happen, I apologize. Your graduation was epic—as good as what just happened today at the Kanazawa College of Art's graduation ceremony. Each year, new grads dress up in costumes as they take to the stage and receive their degrees. 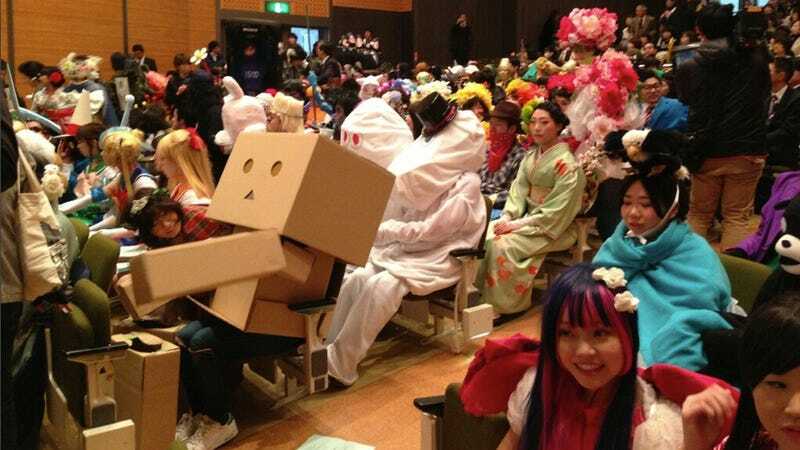 The graduation's cosplay was such a big deal that there was even media coverage... of the outfits! Fun fact: One of the university's most famous grads is Nintendo's Shigeru Miyamoto. Suddenly, you might think, the Pikmin and the Wii Remote cosplay make more sense.